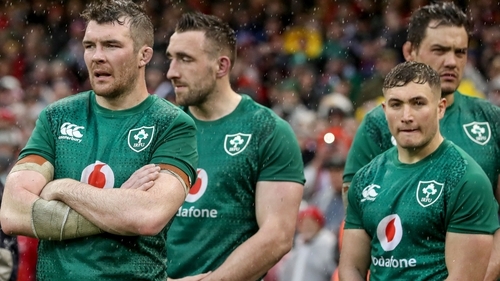 As the post-mortem of Ireland’s Six Nations campaign continues, one former international suggests that the players must admit to being under pressure and harness that fact into improved performances. Stephen McIvor played for Munster and won three Ireland caps in the 1990s and now works as a sports psychologist. The 2018 champions finished third in the tournament but heavy defeats to England and Wales have left many questions unanswered. How did the performance levels drop from a scintillating win over New Zealand just four months ago? Can the team recover using just four friendly games before the World Cup in September? Players and management talk about the small margins and McIvor agrees that it is little things that make a difference but there are mental issues that should be addressed as well. "[We need to] recognise that we are carrying too much stress to be able to perform the skills which are leading to the breakdown of those skills," he told the RTÉ Rugby podcast. "If we don’t recognise that we are carrying too much stress and release that stress then we are not going to lead in an appropriate way. "[There]is a common misconception, that if it’s not working, train harder but we know it’s about training smarter in terms of psychology. "Maybe Joe Schmidt is holding these things in reserve"
"One of the top coaches in my research said some of the best training sessions we had before really serious matches were the ones we cancelled, were the ones we knew the players weren’t in the right place to go out and push things because they were under stress. "Our technical skills don’t change over a period of time; it takes several months so it’s not that. "I would say it’s psychological, holistic in terms of the environment and some tactical nuances. Maybe Joe Schmidt is holding these things in reserve. "We [as humans] tend to [over-alarm ourselves]. We are predetermined and conditioned to protect ourselves so we look for threats instead of positives. "On the psychological aspect, maybe we need to go back to what we do well, trying to lift that pressure and put it back into controllable factors. "But definitely recognising we were probably carrying too much tension and too much tension with the group." After Ireland beat New Zealand, the All Blacks boss Steve Hansen wondered if the team could cope with a target on their back, not having the comfort of the underdog tag. As part of a wide-ranging discussion, McIvor said that human beings are more comfortable having a "purpose" and having achieved a home victory over the double World Champions for the first time, Ireland may have eased up slightly. "When we climb a hill or get to the top of a mountain, if we feel we’re arrived at the top we start protecting that," he said. "We possibly fell into an inkling, a percentage point of complacency after beating New Zealand or more likely, protect what we have already achieved and done." "It’s ironic that when we gain success we can often start protecting ourselves"
"Human beings find it hard to grow, we find change difficult but we are also conditions where that is where we feel a purpose. Purpose is massively important for us. "It’s ironic that when we gain success we can often start protecting ourselves. If we go back to the process for the likes of the [great Kilkenny, New Zealand, Patriots and Barcelona teams], it’s constant growth, constant improvement, how do we get better? "And that actually reduces the stress and worries about protecting something we don’t have."